Place a pan on the stove,add oil to it.After heating,add chopped onion then saute for a while,after the onion pieces turn brown add aloo,green peas, carrots, then add biryani leaf,cloves ,cinnamon,onion paste,ginger paste,green chillies and dhania jeera powder,and fry in low temp.Lastly add chopped capsicum and fry for 2 mins.Now add washed basmathi rice and fry for a moment,then add water and salt and cook till done.After it is half cooked add mint and corriander leaves and mix well. 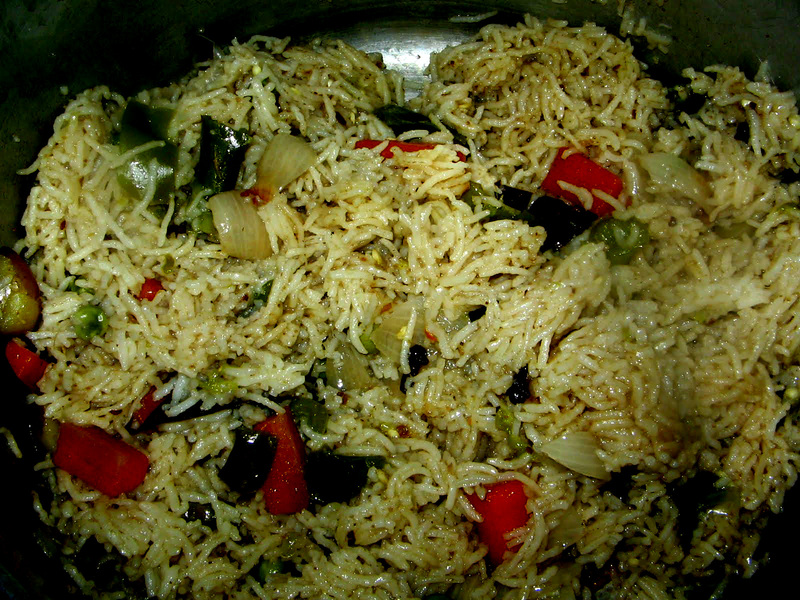 Serve hot with raitha or mixed veg curry.Iexperimented this with a very few alterations after listening it from one of my friend..
Wow the rice looks very colourful it makes me hungry. Rice looks yummy..will try it someday..
only green capsicum is available at my place,but addition of red and yellow coloured capsicums will be more attractive..
Looks delicious! The photograph tempts to try this immediately!